Discover the common temptations every sales professional faces and learn sales strategies to overcome them. Irish writer and poet Oscar Wilde famously wrote, "I can resist anything except temptation." Humorous, yes, but not exactly true. In order to produce lauded works such as The Importance of Being Earnest and The Picture of Dorian Gray, Wilde no doubt resisted the temptation to sit idle, or the temptation to call it “good enough”. Succeeding in life and sales requires the willpower to resist (most of) the inevitable temptations we face daily. The three sales temptations listed below are universal – every sales professional must overcome them to enjoy both short-term and long-term success. Fear not, we have also included tactics for overcoming them. We all know by now to let the client do the talking, to ask open-ended questions before blurting out the facts and features about what makes our offerings awesome. But often it’s the prospect who prods us into talking about ourselves, diverting us from our sales strategy. Be sure to include in your sales strategy a tactic or two that works to steer the initial conversation back onto the road to discovery. When is the last time a salesperson “closed” you? If your mentor recommends the A.B.C. (Always Be Closing) sales strategy, it’s time to find a new sales adviser. Old-school tactics like the assumptive close (do you want the basic package or the premium? ), the sense of urgency close (I can shave 20% off the price, but only if you buy now), and the reverse close (Is there any reason you wouldn’t do business with our company?) are painfully transparent to professional decision makers, and are a sure way to stop any sale dead in its tracks. They may work for door-to-door salespeople – yes, these still exist – but they won’t work for you. Mrs. Prospect, to date we’ve validated that this service can help you achieve x,y and z, which you said were your biggest needs. We’ve performed a thorough tech audit that assures the solution will integrate with your existing technology and have shown an expected ROI of seven months, which is well within your acceptable time frame of 12 months. Now that you’ve had a chance to talk with the three customer references, is there anything else we need to cover before signing the proposal and proceeding to the implementation phase? The salesperson in this example clearly identified the prospect’s needs at the outset and built an ongoing relationship that allowed the sale to move through each phase of the funnel. This sales pro has earned the right to ask for the sale. Will Rogers said, "The road to success is dotted with many tempting parking spaces." In sales, it’s easy to feel a sense of accomplishment after a mammoth month or an award-winning year. And you should feel good about yourself. You earned it. But success is a journey, not a destination. We can’t afford to become lazy in the disciplines that allowed us to succeed in the first place. We can’t afford to stop thinking big. Your sales strategy should include motivational tactics you can turn to whenever you start to feel a little too “comfortable”. It could be a book, a mentor or a bookmark folder filled with sales strategy blogs… whatever works for you. The Pulse App is also a great way for sales pros to quickly gain motivational insights and sales tips from industry influencers while on-the-go or waiting. 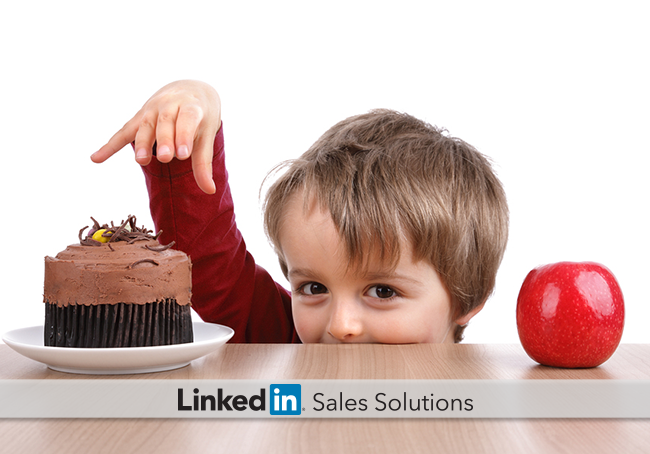 What sales strategies do you use to avoid temptation? Find out how LinkedIn Sales Navigator can help you avoid the temptation to sit idle by delivering high-quality leads whenever you need them.